Whether you are visiting family, vacationing, or working nearby, our RV campground is the ideal place to park your camper trailer. Nile Valley RV Park offers a comfortable atmosphere with amenities, such as free Wi-Fi™, cable tv connections, and weekly laundry services. Contact us to find the best rental option that works for you. Free pick-up and delivery Laundry service @ $1.25 per pound (laundry soap of your choice provided). That's a DEAL! If you are vacationing in Bay City, Texas, and the surrounding area, and you need a place to park your RV and stay for one night or more, turn to Nile Valley RV Park. Conveniently located near restaurants, shops, and just 30 minutes away from Matagorda Bay and Beach, our RV park is still secluded enough to provide peace and tranquility from the city. 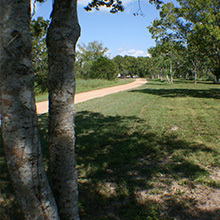 Our quiet campground offers a relaxed environment, nestled among shade trees. Also, we offer a customer pavilion. We offer cable TV connections and wifi to the camp sites. If you're interested in enjoying a campground with modern amenities away from the hot sun, then call us for pricing details. We offer daily, weekly, and monthly stays. Monday- Friday: 8:00 a.m. - 6:00 p.m.
Saturday and Sunday: 9:00 a.m.- 2:00 p.m. Call for After-Hours Appointments or feel free to come take a drive through anytime.